380 million eggs coming from Wright County Egg of Galt, Iowa have been recalled in several states over potential salmonella contamination, linked to seven reported cases of Salmonella in Minnesota, eight in Colorado, 266 in California, and many more in other states. Even if consumers have already checked their eggs based on the original egg recall list, officials at Wright County Egg suggest looking again. One end of each egg carton is stamped with a number starting with a P (which stands for plant). If the number on your carton is P1720 or P1942, look carefully at the three-digit number that typically follows it. If you're checking eggs for the first time, also look for these plant numbers from the original recall: P1026, P1413, and P1946. That recall involved date numbers 136 to 225 (May 16 to Aug. 13). Tthe eggs may have been sold under any of the following brand names: Lucerne, Albertson, Mountain Dairy, Ralph's, Boomsma's, Sunshine, Hillandale, Trafficanda, Farm Fresh, Shoreland, Lund, Dutch Farms and Kemps. Wright County Egg says consumers should return purchased eggs affected by the recall to the store where they were purchased. For more information, consumers can visit the Egg Safety Center, or call Wright County egg's information line at 866-272-5582, which contains a recording with recall details and instructions. Mr. DeCoster is well known to federal regulators. In 1997, one of his companies agreed to pay a $2 million fine by the Occupational Safety and Health Administration for violations in the workplace and worker housing. Officials said workers were forced to handle manure and dead chickens with their bare hands and to live in trailers infested with rats. The labor secretary in the Clinton administration, Robert B. Reich, called Mr. DeCoster's operation "an agricultural sweatshop." Mr. DeCoster's facilities have also been periodically raided by immigration officials. In 2003, Mr. DeCoster pleaded guilty to charges of knowingly hiring immigrants who were in the country illegally and he paid more than $2 million as part of a federal settlement. Mr. DeCoster was also charged by Iowa authorities in the 1990s with violations of environmental rules governing hog manure runoff. By MIKE STOBBE and MARY CLARE JALONICK (AP): Hundreds of people have been sickened in a salmonella outbreak linked to eggs in four states and possibly more, health officials said Wednesday as a company dramatically expanded a recall to 380 million eggs. The Centers for Disease Control and Prevention is working with state health departments to investigate the illnesses. No deaths have been reported, said Dr. Christopher Braden, a CDC epidemiologist involved in the investigation. Initially, 228 million eggs, or the equivalent of 19 million dozen-egg cartons, were recalled by the company Wright County Egg of Galt, Iowa. But that number was increased to nearly 32 million dozen-egg cartons. Minnesota, a state with some of the best food-borne illness investigators in the country, has tied at least seven salmonella illnesses to the eggs. Other states have seen a jump in reports of the type of salmonella. For example, California has reported 266 illnesses since June and believes many are related to the eggs. Colorado saw 28 cases in June and July, about four times the usual number. Spikes or clusters of suspicious cases have also been reported in Arizona, Illinois, Nevada, North Carolina, Texas and Wisconsin. Salmonella is the most common bacterial form of food poisoning. And the strain involved in the outbreak is the most common strain of salmonella, accounting for roughly 20 percent of all salmonella food poisonings. Unfortunately, current lab tests do not allow health officials to fingerprint this form of salmonella as precisely as other kinds of food-borne illness. So determining the size of a salmonella enteritidis outbreak is a little more challenging, Braden said. The Food and Drug Administration also is investigating. Much of the investigation so far has been centered on restaurants in California, Colorado, Minnesota and North Carolina. They are not necessarily breakfast places -- it's possible some got sick from eating a salad dressing that had a raw egg in it, or eating soup with an undercooked egg dropped in, Braden said. In North Carolina, a cluster of about 80 illnesses in April were linked to meringue-containing chocolate pie and banana pudding served at a Durham barbecue restaurant, health officials said. 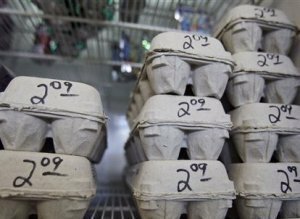 Eggs from Wright County Egg were linked to illnesses in the four states. The eggs were distributed around the country and packaged under the names Lucerne, Albertson, Mountain Dairy, Ralph's, Boomsma's, Sunshine, Hillandale, Trafficanda, Farm Fresh, Shoreland, Lund, Dutch Farms and Kemp. It wasn't immediately clear when the eggs were produced and distributed. The initial recall was issued last week. Eggs affected by the expanded recall were distributed to food wholesalers, distribution centers and food service companies in California, Colorado, Minnesota, Arkansas, Arizona, Georgia, Illinois, Iowa, Oklahoma, Oregon, Missouri, Nebraska, Nevada, Texas, Utah, Washington and Wisconsin. "We are undertaking this additional recall to further protect the safety of consumers -- this voluntary measure is consistent with our commitment to egg safety, and it is our responsibility," Wright County Egg officials said in a statement Wednesday evening. In an earlier statement, company officials said the FDA is "on-site to review records and inspect our barns." The officials said they began the recall Aug. 13. This form of salmonella can be passed from chickens that appear healthy. And it grows inside eggs, not just on the shell, Braden noted. Thoroughly cooking eggs can kill the bacteria. But health officials are recommending people throw away or return the recalled eggs. Associated Press writers Ken Ritter in Las Vegas, Bob Christie in Phoenix, Betsy Blaney in Lubbock, Judith Kohler in Denver and Todd Richmond in Madison contributed to this report. BY MARY CLARE JALONICK: WASHINGTON (AP) -- An Iowa egg producer is recalling 228 million eggs after being linked to an outbreak of salmonella poisoning. The eggs were distributed around the country and packaged under the names Lucerne, Albertson, Mountain Dairy, Ralph's, Boomsma's, Sunshine, Hillandale, Trafficanda, Farm Fresh, Shoreland, Lund, Dutch Farms and Kemp. In a statement, company officials said the FDA is "on-site to review records and inspect our barns." The officials said they began the recall Aug. 13. ST. PAUL, Minn. (AP) - State health officials say seven salmonella cases in Minnesota have been linked to a multistate egg recall. The salmonella cases were identified in two restaurant outbreaks in May and in July. Health officials believe the eggs are the likely source. The eggs from Wright County Egg of Galt, Iowa were delivered to food distribution centers and food service companies in eight states, including Minnesota, Wisconsin and Iowa. Minnesota Public Radio reports that for every confirmed salmonella case, state health officials estimate there are 38 unconfirmed cases. The affected eggs are also being recalled in California, Colorado, Nebraska, Illinois, and Missouri. The affected cartons come in varying sizes and carry plant numbers P1026, P1413 and P1946, followed by a date code ranging from 136 to 225. The stamps with the date codes and plant numbers can be found on the end of the egg carton, and the eggs may be sold under any of the following brand names: Lucerne, Albertson, Mountain Dairy, Ralph's, Boomsma's, Sunshine, Hillandale, Trafficanda, Farm Fresh, Shoreland, Lund, Dutch Farms and Kemps. "Our primary concern is keeping Salmonella out of the food supply and away from consumers. As a precautionary measure, Wright County Egg also has decided to divert its existing inventory of shell eggs to a breaker, where they will be pasteurized to kill any Salmonella bacteria present," the statement said. "Consumers who believe they may have purchased these shell eggs should not eat them but should return them to the store where they were purchased for a full refund. This recall is of shell eggs only. Other egg products produced by Wright County Eggs are not affected."